"When I write about a work of art, I usually like to situate it in an art historical perspective, since no piece of art exists in a vacuum. We all know that artists are influenced by their context and by other artists. When I looked at Eolake Stobblehouses painting of a running yellow figure against a bluish background, of course, I saw some influences by artistic precedents. The piece seems to be influenced by abstract art. Its color scheme, however, could have been part of a Van Gogh painting. The figure itself, made up of splashes of bright yellow, may be seen as a more modern version of Joan Miros Surrealist stick figures. Yet, if you look at the piece as a whole, none of these individual descriptions really fit it. Its a whimsical piece, but not really Surrealist. 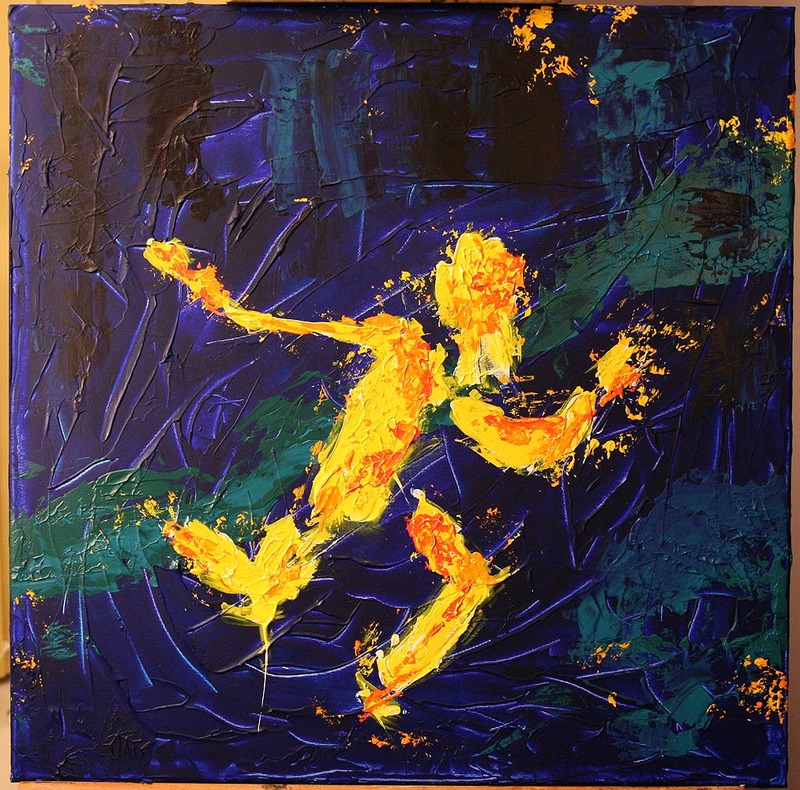 Its abstract in its method and texture, yet it clearly represents a man running. Its not emotional, yet its Expressionist in its energy and color scheme. In other words, its an original." Claudia Moscovici is the author of seven scholarly books on political philosophy and the Romantic movement, which include Romanticism and Postromanticism (Rowman and Littlefield, 2007), Gender and Citizenship (Rowman and Littlefield, 2000) and Double Dialectics (Rowman and Littlefield, 2002). She co-founded the international art movement called postromanticism with the Mexican sculptor Leonardo Pereznieto (postromanticism.com). She taught philosophy, literature and arts and ideas at Boston University and at the University of Michigan. She has also published poetry, short stories and essays in many literary magazines.